Inking It Up With Cathy: Are You Dressing Up? Carving a Pumpkin? Hiding in the Back of a Dark House? Are You Dressing Up? Carving a Pumpkin? Hiding in the Back of a Dark House? On Friday, I told you that we are in a neighborhood with very few children. So there are some years where we get 8-10 kids come by and some years where we don't get any. So here's my question - do I buy candy that I like - thinking that I will eat it if we don't give it all out? Or do I buy something I would never eat - thinking that I will save on calories but it will sit in the cupboard until next Halloween? I'm thinking getting something I like - I mean really - we need chocolate to keep functioning, correct? Thanks for talking me into it - Milky Ways and Reese's Peanut Butter Cups at my house! Here's my other Halloween card for you this year. 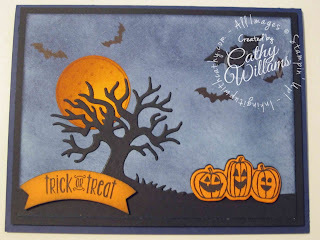 I sponged Whisper White cardstock using Dapper Denim (don't you just LOVE this color?) and at the top with just a tiny bit of Night of Navy. Start light so you can get a really mottled look. The moon was sponged using Daffodil Delight, Pumpkin Pie and Tangerine Tango just like Friday's card. Here's a little trick with your pumpkins. 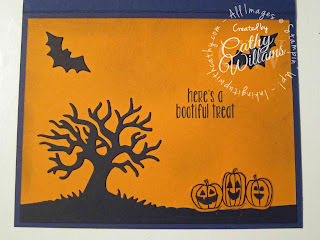 Stamp the actual pumpkins on a piece of paper. Set the stamps of their faces down onto the paper in each of the three spots you want them. Then just press down on them using your acrylic block - bam! They can all be stamped at one time. 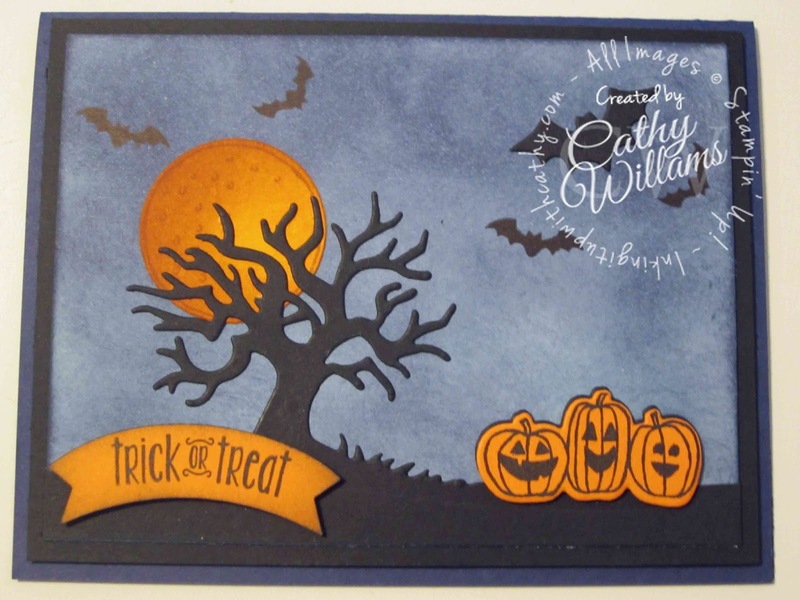 Super convenient if you are stamping more than one set of pumpkins. Keep Thinking Outside the Box... Or Basket! Do You Send Out Fall or Thanksgiving Cards?